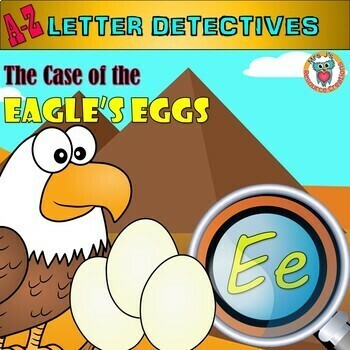 Letter E Worksheet Activities combined with a fun mystery to engage and motivate your students! The preparation of this is easy and once your students do one of these they will be able to do the rest in the series with less explanation each time. Additional materials required - One brown paper bag or a small box (something similar will do, this is for you to hide the clues in). Laminating materials (only if you want to print once and reuse again year after year). A small amount of prep is required to get your clues ready before beginning the mystery. The rest is print and photocopy the Mission Worksheet pages for your students. Have the video hook ready for viewing. The MP4 file is included in the download. You will need to read the text aloud to your students like a visual video story. Choose from the color or B/W editions in the download. Set the stage to engage with the video hook story (written story included too). Show your students the possible suspects. Tell them that as they complete missions the class will earn a clue that will help them solve who the thief is! The completion of each Mystery Mission worksheet earns a clue. You can choose to award your class with a clue at the end of each worksheet, or at the end of a session of # of worksheets. However many Mission Worksheets your students complete, is how many clues they earn. Award clues as a class by randomly picking the cards from your bag or box. Each clue will eliminate a character off the suspect list. Cross off the character from your suspect page hanging somewhere in your classroom, or if you set them up as individual cards, remove the suspect card from the board. TIP - It is recommended that the clue reveal and process of elimination is done as a class with the teacher and not independently. An optional short ending video clip is provided for your students too. I've had to leave the culprit out of this though since you will be in control of who you want the the thief to be. Optional AWARDS provided to print and give to your student detectives. What do the Mystery Mission Worksheets Involve? There's an optional page at the end where your students can cut out the thief and paste the picture in jail. Color and B & W Editions included. >> CLICK HERE to follow my store << to find out when more are available.